The Cotswold Lion is a well established and popular biannual publication that ‘is the go to’ walking and exploring magazine of the Cotswolds Area of Outstanding Natural Beauty. 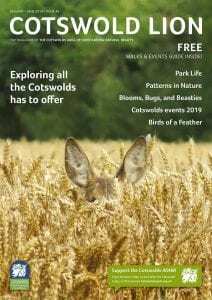 Each issue is packed full of things to do in the Cotswolds, places to visit and and guided walks to explore. Your can pick up your copy of the magazine from attractions, hotels and Visitor Information Centres across the Cotswolds or download your copy below. When you have finished with the magazine please pass it on or recycle it. If you are a business or organisation wishing to stock the Cotswold Lion this is available to order in bulk through Glide Media. cotswoldlion@cotswoldsaonb.org.uk or call 01451 862003. Thank you to all of our advertisers. The income from our advertising goes towards the cost of the production, which enables us to continue to provide a free magazine.